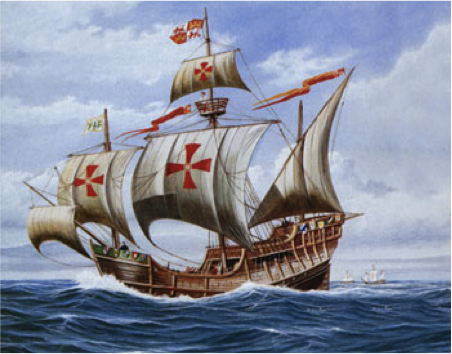 When Christopher Columbus ‘pitched’ Queen Isabella of Castile and King Ferdinand of Aragon to fund his golden voyage west bound to India, what do you think was the nature of the opportunity? Here’s one way to think about it. First, think about the ‘Prize’ – What was the intended prize for the second Iberian power (Portugal being first at the time 🙂 ? As you know, that was a large piece of the spice trade. For the voyagers themselves, the other incentive was also the adventure involved, of course. But specifically, what was the venture to get to the prize? That was the ships and associated logistics required for the nature of the route itself. Portugal had (virtually) secured the eastern maritime route to India around Africa and other central Asian powers and Italian alliances had the land route through Asia Minor. Now using the terms of ‘known market’ and ‘unknown market’ – how would you assess the situation? The market isn’t the spices. That’s the vision or seminal shift that has occurred in western society to value spices for food preparation (things must have tasted awful before then, not to think of something needed to mask the decay). The market in this case is the route. Thus, eastward around Africa or through land were ‘known markets’ (but essentially locked-up by stiffer incumbent competitors). The unknown market was the western, oceanic route – one just couldn’t be sure of the size of the circumference of earth was or that sea currents and weather would favor such a perilous journey. The incumbents had no incentive to try things another way, especially since it seemed risky and not as profitable (the innovator’s dilemma) – in this case, we know they were right as far as getting to India, just for the record. Columbus was doing his part in the pitch as an entrepreneur (positive about his assumptions and lying with statistics). He argued that the girth of the earth wasn’t that large and that the proposed route wasn’t as disadvantageous as the other two. As prudent investors, the Kings could run a simulation in their minds, considering the ‘what if’ scenarios in which Columbus could be wrong or off. Specifically the length and time of the voyage being longer if the earth was indeed wider, etc. So what do you think they considered before making the decision? Well, they likely considered the costs of being wrong, but also weighed that against the costs of doing nothing and letting other nations leave them further behind the spice race. No one really knows why they ultimately funded the voyage, but here’s what they likely deliberated. First, they accepted the total failure outcome (aka affordable loss), but knew it wouldn’t ‘bring down the whole farm’ in it of itself – three ships is three ships, and of course, some lost time or opportunity costs in pursuing other options (including direct competition in the other routes or finding a new paradigm shift or trend besides spices and continuing to eat bad food (so no Paella in the future). Second, they knew that even if the western oceanic route didn’t pan out to be as profitable, it was still better being the leaders in that route than a distance second or third in the other routes (having little or no competition in a smaller market can be better than vicious competition in a sure thing market). Third, they probably did weigh in the adage that ‘fortune favors the bold’, not specifically that they thought they’d find America, but that perhaps they would learn about sea currents, different places in India or Asia, etc. that could provide a future competitive advantage. In other words, they chose to be contrarian, knowing that if they were right, they had the opportunity for attractive profits because others weren’t even trying. BTW, the story above can be mapped, no pun intended, to the Qualcomm story – the local San Diego, very contrarian and very successful technology company in the wireless communications space. Back when Qualcomm started in the mid eighties, the way to do cellular communication (for the most part) was through TDMA, better know as GSM. Qualcomm could have decided to build chips for that market, competing on small differences with other competitors. A strategy, especially as a new entrant, usually doomed for failure or moderate success. Because Qualcomm wanted ‘big success’ it bet on a contrarian play, CDMA. CDMA turned out to be 15-20% of the overall market, but Qualcomm had almost 100% of that niche, with wider margins than the slew of players competing in the other 80% of the market. Then as an established, larger player, Qualcomm had the option of getting into the WCDMA or UMTS market (where it competes in a larger known market with other players, but with a few competitive advantages, only privy to a larger established organization (reputation, entrenched contracts, scale, patent pool, etc.). The seminal trend involved in the Qualcomm story, btw, is the shift towards cellular communications in general (as handsets become smaller, more affordable and moved away from a car-only gadget to a personal gadget). The fortune favors the bold, was the somewhat unexpectedly fast deluge in the need for data (and smart phones) – which made being an integrated chipset provider much more attractive. The lesson here is to take big risks only when commensurable large rewards are also at bay. To understand that attractive pay-offs can only be viewed when considering the competition, not in isolation. To understand the difference between a seminal trend that underpins most opportunities (advertising shifting online, TV viewing shifting to recorded shows, etc.) and a more specific contrarian play or secret sauce to get to the destination. In your pitches, think about how to apply these lessons, which can also be seen as an options theory metaphor. What is the underlying value of what you offer (intrinsic, customer value)? Why is it an idea for the ages (trend, growth value and potential)? Why is there a large financial potential (contrarian or competition avoiding play with high variability (could be a home run)? Against the wind | Necrophone. I do have some questions for you if it’s allright. comments appear as if they are left by brain dead visitors?